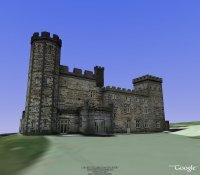 The Unmutual Website is indebted to Tim Palgut, author of "The Prisoner Files", for providing details of his latest 3D achievements, that of using Google Earth to create a 3D Castell Deudraeth (left). Writes Tim; "I'm working on Portmeirion, but Google Earth's terrain is so innaccurate in that area that I'd have to recreate the entire area terrain-wise (which they frown upon)". More of Tim's work, including images creasted for the above-mentioned book, can be seen on a special page HERE. With thanks to Tim Palgut for this new item.